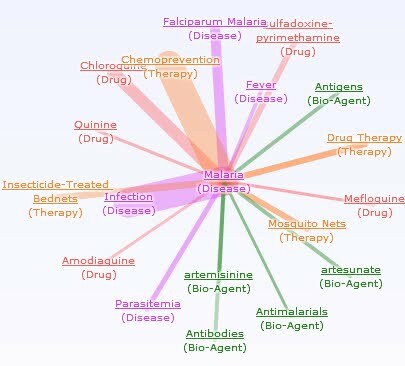 Visual Medical Dictionary by Chi is an interesting medical search engine that provides a unique way of visualising information. Like any search engine you start by typing. In this case either a therapy, disease, or medication, upon which a number of potential subtopics will be made available for selection. Click on each one to receive in depth information on drugs and biologics for that subtopic. Now for an example. 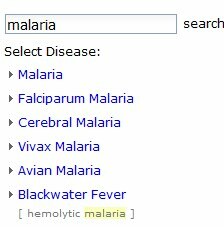 In light of World Malaria Day on April 25th, I thought I would give the search term 'Malaria' a try. The middle column contains some basic information regarding the topic. Finally the last column provides information in a mindmap format. Information is also categorised via colour coding. 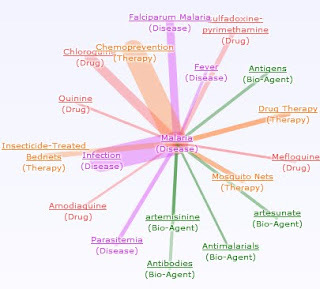 This online medical dictionary goes beyond others by illustrating the interactive network graph of related drugs, diseases and therapies. By clicking on a topic within the mindmap, the web expands to also illustrate that topic's related network. 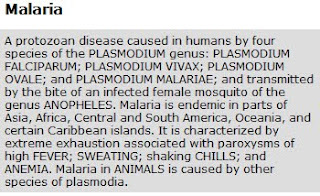 To alleviate any fears about data accuracy, the majority of the data is sourced from the National Library of Medicine (USA). Overall I found it quite easy to use, and would definitely recommend it as a quick reference resource or starting point for an assignment.